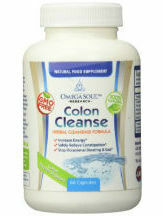 This is a review of Colon Cleanse, a dietary supplement manufactured by Omega Soul. According to the manufacturer, this product aims to help improve bowel health. * In what follows, we present the details of this product to help you decide if it is right for you. Additional ingredients include gelatin, magnesium stearate, and silicon dioxide. The manufacturer advises starting with 1 capsule, preferably taken before going to sleep. After a few days you may start to gradually increase the quantity you take until you achieve the desired results. One bottle of Colon Cleanse containing 60 capsules costs $15.78, which is in line with similar herbal products on the market. Always check with your doctor before taking dietary supplements. This is especially important for pregnant and nursing women, individuals with kidney problems or other underlying medical conditions. Stop using Colon Cleanse immediately and contact your physician if you develop any digestive discomfort. Information regarding product returns and refunds is not made available by the manufacturer, and can only be obtained by sending an e-mail to the address provided on the company’s website. Unfortunately, the company does not have reviews on its website, which may raise concerns for some customers. Omega Soul’s Colon Cleanse appears to be a well-made product. The ingredients are selected appropriately and the price is affordable. On the other hand, there is a notable downside regarding the lack of concrete information concerning refunds and product return. Additionally, the absence of any reviews, which is a must for every serious company when trying to persuade new customers to buy its product, is worrisome.